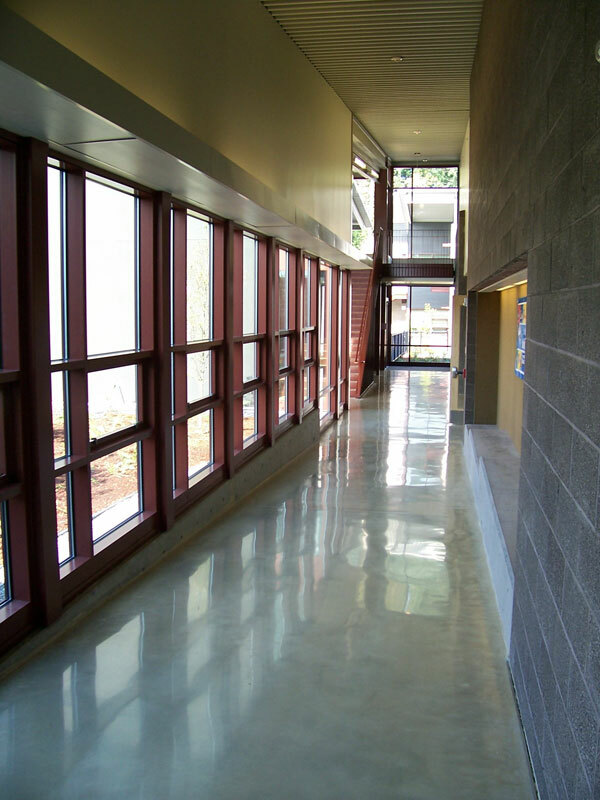 Polished, densified concrete, such as this installation at the Benjamin Franklin Elementary School in Kirkland, Washington, offers a highly durable, low-maintenance flooring option for schools and other buildings. The longer I research green building practices, the more I appreciate innovations that are not just functional and environmentally responsible, but also cost-effective. Such is the case with polished, densified (hardened) concrete flooring. Stone polishing techniques from Europe, coupled with mineralizing chemical treatments developed in the U.S., are allowing us to turn one of the oldest materials in building—concrete—into one of the newest, greenest, and most affordable flooring options available. This article examines the relatively new practice of grinding and polishing a concrete slab floor (new or existing) to a high sheen in a process that also involves hardening the material using silicates or related compounds. Used primarily in schools, warehouses, big-box retail stores, and industrial buildings, this practice also applies to commercial office buildings and even homes.